Volkswagen promotes the e-Delivery as a milestone for emerging markets as the electric truck will be made in Brazil from 2020 at Volkswagen Caminhões e Ônibus, a subsidiary of Traton, formerly VW Truck & Bus. 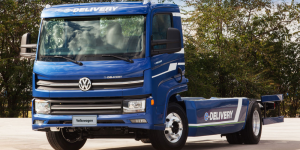 The many names indicate that much is in motion at Volkswagen and indeed, the e-Delivery utilises a new platform that VW introduced last year, saying it would underpin electric trucks and buses of all brands in future (we reported). In case of the e-Delivery, this architecture holds an electric powertrain with an output of up to 260 kW developed in Brazil as well as a new battery pack that allows for a range of more than 200 kilometres. 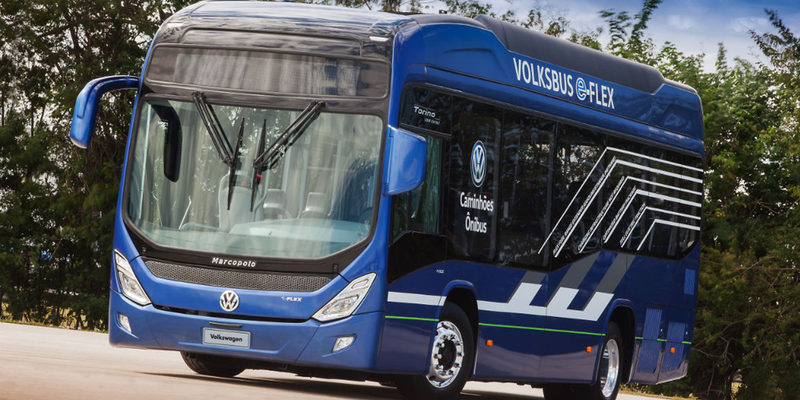 The cells are of lithium-ion-nickel-manganese-cobalt (NMC) and the battery can be charged to 30 percent capacity in 15 minutes and 100 percent in three hours, says VW Caminhões e Ônibus. The exact capacity remains unspecified. The Brazilians stress though, that the electric truck is modular, meaning it comes in three parts: the front module includes the driver’s cab, the centre section the batteries and the rear part the drive train. This ensures that the various components can be flexibly combined and also frees space for additional batteries. The Brazilian brewery Ambev has already announced its intention to add a total of 1,600 Volkswagen Caminhões e Ônibus electric trucks to its fleet by 2023 reportedly. They are currently undergoing one of several test phases. But the electric truck is not the only innovation by Volkswagen Caminhões e Ônibus at the IAA. Also on show is the so-called e-Flex, an architecture that enables the electrification of all Volksbus vehicles of the brand as BEV, PHEV, HEV or REEV. The system includes a generator and motor that charges the battery in case there is no external charging, so that it serves as a range extender in some cases. The batteries used in the platform come from the Traton Group. Being a modular model as well, the e-Flex Volksbus will serve as foundation for the electrification of future distribution trucks and city buses of the Volkswagen Truck & Bus brands.